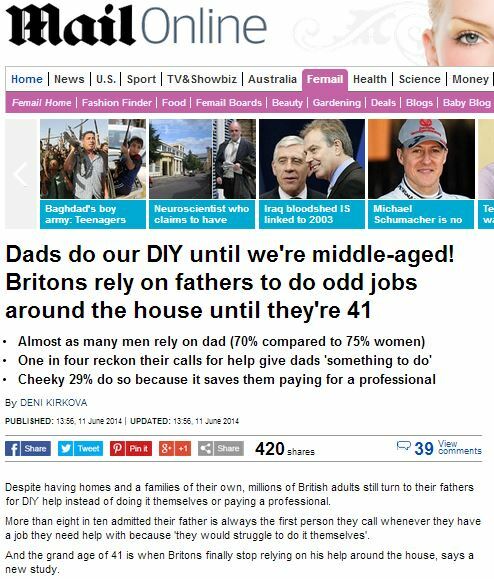 Despite having homes and a families of their own, millions of British adults still turn to their fathers for DIY help instead of doing it themselves or paying a professional. More than eight in ten admitted their father is always the first person they call whenever they have a job they need help with because ‘they would struggle to do it themselves’. And the grand age of 41 is when Britons finally stop relying on his help around the house, says a new study. A spokesperson for sugru, a brand of self-setting rubber, who commissioned the research, said: ‘Most parents look forward to the day their children move out as it marks the end of having to look after them. This entry was posted in Surgu and tagged daily mail, deni kirkova, Surgu on June 20, 2014 by Michael Marshall.